Cinderella at her new home! 13 weeks old. Cindy, Tinkerbell and Ginger before first day at the spa! We almost changed her name to Snowball! Love my new winter coat! I had a min poodle for 18 years and a boxer until she died of heart failure in 2006. My 4 year old daughter was diagnosed with dog allergies in 2004, so we couldnt get a another dog until she was more able to deal with her allergies. She is now 11 and I thought now is the time. What a joy Cindy is. She is at least as intelligent as the poodles, if not more. She learns so quickly. 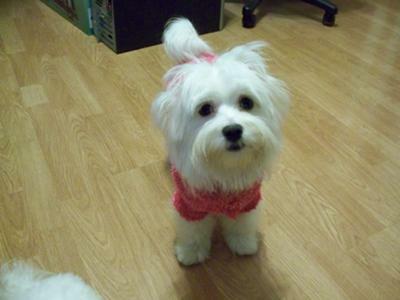 She is a small Coton, and though she was the smallest pup in her litter, she is the biggest at her new home. She is now about 7 pounds. She is so funny and keeps us laughing all the time. She loves the snow and gets along very well with her step sisters. She also loves to dance. She will soon be ready to go to the ball! Training 3 puppies at the same time can be a test of your patience, but I am so glad that we got Cindy. She is almost 8 months old now. She is so beautiful, and so loved. 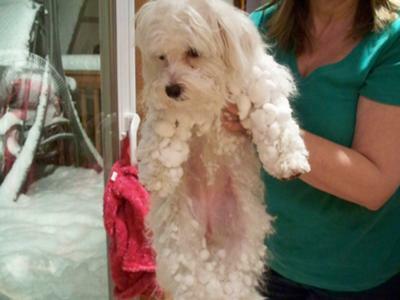 Welcome to the club of Coton lovers. What a beautiful girl you have! Thank you all for your lovely comments. I'm glad the Princess and her sisters could make you smile. Cindy is slow to trust also, but is coming around now. She will now let us hold her like a baby and rub her tummy, but only when she wants it. They definitly are hard to find in the snow. All white pups was not planned, it just worked out that way. That's why they each have hot pink sweaters. I have 3 human daughters so I know how much fun it can be and also how they test your patience! 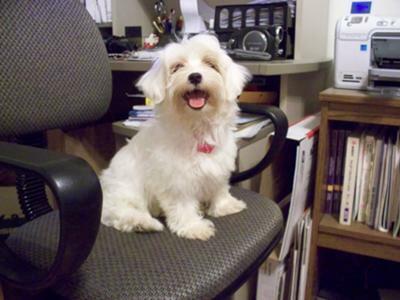 Our Coton, Dexi, LOVES his canine sister, but is still working on trusting 2 of his human ones! Cindy and her sisters are beautiful. Enjoy them this winter! They must be hard to find in the snow! 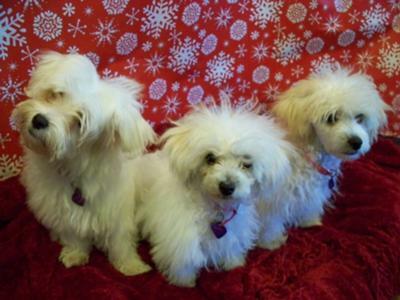 Thanks so much for sharing your beautiful Coton (and poodles) with us. You are definitely a brave woman to take on 3 dogs at once. I'm sure the fun and joy outweigh any frustration and fatigue.